“KHLOÉ KARDASHIAN / TORI SPELLING / JONATHAN ADLER AND SIMON DOONAN / BRYAN CRANSTON / AVICII / AMANDA PETERSON / CHAD KROEGER / MARISA ACOCELLA MARCHETTO / LENA DUNHAM”: A new long poem by Ben Fama, selected by early spring poetry editor Ed Steck. “when I die bury me in / my matching pajama set / with a bottle of champagne”: A new poem from Ben Fama, selected by Summer poetry editor, Sasha Fletcher. Ben Fama in conversation with Vanessa Place regarding conceptualism, Trayvon Martin, the founding of self as corporation, and justice. 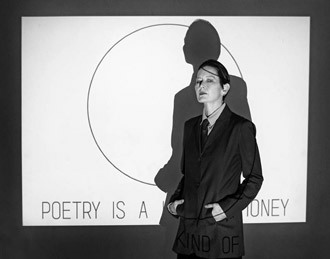 Belatedly but, as always, with the purest of hearts Fanzine offers poet Ben Fama’s thoughtful take on Maggie Nelson’s Bluets. Despite or due to its incorporation of Wittgenstein and Goethe, Nelson described this meditation on the color blue in a grant application as "heathen, hedonistic and horny." 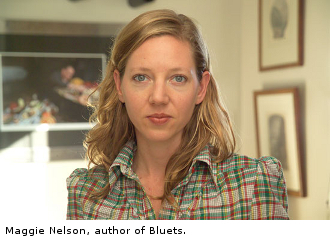 Nelson, who has appeared on Unsolved Mysteries, examined the death of her aunt in The Red Parts and Jane: A Murder and Bluets is not without its darkness.